When I lived in Singapore I watched the presidential debates and conventions online. I used to sit in our living room, lounging on the rattan sofa in my Thai fishing pants, and enjoying the wifi generously shared by the fellows downstairs. Sometimes on the Sundays that I stayed in town I would sit there for hours, unaware of time going by, taking in my Americanness and trying to stay connected to home once in a while. My roommate, who still lives in the flat, would go out in the morning — for muy thai or ballet lessons because she is a very active person in that way — and come back in the afternoon only to find me sitting the same place, mugs and plates for snacks piling up around me. And I would absently make a comment — “That was a really solid speech,” or “I don’t think this is true,” or “What do you think of their approach to Asia?” — to which she would blankly stare or just continue with her activities. Sometimes though, when I wasn’t spacing out, we had really interesting conversations. It’s really interesting to think about American politics from international perspectives. My old roommate is from a town outside of Hiroshima, Japan. Politics in Japan are very different, she told me. She was baffled at Americans and the way they watch politicians and listen to them speak. Japan has had four prime ministers in the last three years; after the charistmatic Junichiro Koizumi’s almost six years in office (which is three terms in Japan), Shinzo Abe and Yasuo Fukuda took the post and then resigned under political pressure before their terms ended. The current Prime Minister, Taro Aso, just postponed until January a general election in which he and his party would have to defend their position. Add to this the financial crisis, and it seems like a good time for political news in Japan. But young people in Japan and the mass media don’t give politicians the airtime that American politicians get here. They are not seen as the people who directly affect lives, and since Koizumi, they are not particularly interesting to watch. The dynamism and hustle of this year’s political race in America was something new to my roommate. So we watched the conventions together, testing my ability to explain some of the more absurd elements American politics and punditry and my roommate’s ability to follow some pretty complex English. Now that it’s election day, I wonder what she would think of the campaigning and media duke-outs — even I am a bit in awe of the Superbowl-like energy, even though I am really excited (I voted!). I’ve never seen CNN get so excited about a multi-touch screen (they need more applications for that, so its not John King doing the same demonstration over and over again), and The New York Times plug its own tech-saavy so heavily. Even the Japanese press are getting excited. So here’s my election night game-plan: 4pm, CNN and local news on television. Online, I’ll be following the Los Angeles Times for my local fix (see this interesting graphic on the historic fundraising for Proposition 8 campaigns), The New York Times and their ticker that shows when major news outlets call races, and some papers in Asia. Many are relying on wire service reports or The New York Times, but I’m finding interesting real-time perspectives so far in the Straits Times of Singapore, the Jakarta Post in Indonesia, and The Times of India. In social media, I’m looking at Global Voices’ special election section and Twitter’s election ticker. This weekend I got my first full-length taste of kabuki and, boy, was it delicious. 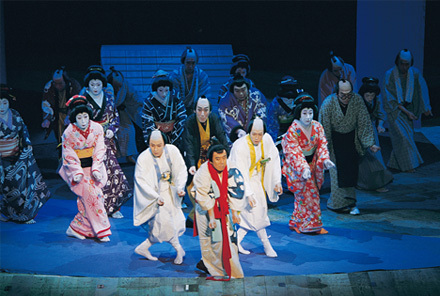 This form of Japanese theater is fantastic and fascinating to watch — for its dramatic acting, stylized makeup and simple, effectual music — but it’s even better when you have some sense of what people are saying. Lucky for me, the Cathay Cineplex in Singapore was hosting the Cinema-Kabuki Festival. The beauty of theater at the movies is that I could see subtitled, film versions of two plays. One was the beautiful Kyokanoko Musume Ninin Dodoji. The other was the brilliantly funny Noda Version Togitatsu no Utare. One of the best ways to learn about a genre is to see a parody of a genre. Togitatsu was so well done that, even through translations of puns, I laughed to the point of tears several times. Like Om Shanti Om is to Bollywood, Togitatsu is a really interesting introduction to kabuki. It’s an ode to an art form that artfully pokes fun at itself. With modern dance moves. Think West Side Story. If you get a chance to see this production, don’t miss it. I’ve been thinking about the Olympics torch relay. It seems to be rousing deep emotions — perhaps some kind of opportunism, or maybe pent up frustrations. But one thing’s clear: Even before the Olympic Games begin, there are some serious political games going on here. Just look at the torch’s run through India and Pakistan (not to mention the way each country’s national press covered it). My roommate, who is from Japan, told me a about a Japanese website that chronicles the extreme sport of Olympic torch relay races. (Japan will run the torch in Nagano “inside a security cordon of Japanese riot police.”) Then I found this little wiki. I don’t know who is running the page, but I hope it stays updated and gets more details going. Update: I am told that the Japanese version of Uncyclopedia is much more comprehensive, and I’m guess by the images, much funnier.